Kashmir Narrator: Let’s begin with the recent agitation in Kashmir, which broke out after the killing of Hizbul Mujahideen commander Burhan Wani and two of his associates on 8 July. Around 100 people were shot dead by police and paramilitary forces, nearly 20,000 injured, while 8,000 were arrested. Not only the government and its host of agencies, even some resistance leaders were caught off guard by the uprising. What was your initial reaction when the agitation started? Dr Qasim: My initial reaction was that the timing of uprising was not appropriate, mainly because of two reasons. Firstly, it’s Syria and Daesh that dominate the attention of the world community, not Kashmir. Secondly, political instability in Pakistan will not allow its government to launch an aggressive diplomacy against India. But then you’ve to understand that the uprising was a people’s initiative, a spontaneous movement. Soon after Burhan’s martyrdom, people came out on the streets on their own, and the leadership got dragged into it. No one can predict or stop such spontaneous uprisings. KN: How was 2016 agitation different from those of 2008 and 2010? DQ: Like 2008 and 2010, this uprising too was reactionary in nature. Only difference being that the 2008 uprising erupted with a short term goal—to force the government to withdraw its order to allot 800 kanals of land to Amarnath Shrine Board. After government withdrew the land transfer order, the people of Kashmir had a sense of achievement, which actually prepared them for the 2010 uprising. But as no short-term goal was set for the 2010 uprising, people got disappointed and dejected. Same has happened this time as well. The Indian media and Indian stooges in Kashmir are already saying ‘Ab kya hasil huva’. I would like to ask the Indian media a simple question: What did their leadership achieve by launching the Non-Cooperation Movement, the Civil Disobedience Movement and the Quit India Movement? To the Indian stooges in Kashmir, my question is: What are you achieving by offering Salah and keeping fast during Ramadan? These Indian stooges who do not believe in the Hereafter measure every human sacrifice by worldly means and gains. I see many positive things in these uprisings, particularly in 2016 uprising. KN: Like the previous agitations, there were moments of hope and hopelessness as well among the people. Even Syed Ali Geelani, who was issuing protest calendars along with Mirwaiz Umar Farooq and Mohammad Yasin Malik, got carried away by the street intifada when he said that ‘azadi is round the corner.’ Four months later, as fatigue set in among the people given the scale of repression by the state, it appeared that the leadership had lost the plot. Geelani was asking the intellectuals to suggest how to carry the movement forward. Don’t you think the resistance leadership was operating without any homework? DQ: As I said earlier, the 2016 uprising was a people’s initiative. So where does the question of homework arise? Leadership was dragged into it. In my opinion, the biggest mistake leadership committed was that it did not set achievable targets for this uprising. Once you’ve short-term targets before you and you’re able to achieve them, it gives you a sense of confidence and hope. It keeps sentiments for long-term goals alive, and at the same time, it provides pro-active character to the movement. KN: In your view, what are the positives and negatives of the 2016 agitation? DQ: The most positive thing of the uprising was the death of PDP. It took people of Kashmir 50 years (1938-1988) to demolish National Conference’s political and social sanctity. The PDP, which was founded by Indian intelligence agencies as an alternative to the National Conference to keep the people of Kashmir engaged with the Indian political institutions (Assembly and Parliament), lost its political and social sanctity in just 17 years (1999-2016). 2016 was the year of PDP’s death. Another positive thing was that the anger against India’s occupation was displayed by both men and women with passion. It was a befitting reply to the Indian propaganda that there is a small group of people who at the behest of Pakistan is talking about azadi. This mass indigenous movement made it loud and clear that people of Kashmir want freedom from India. There was display of unity both at leadership and public level, disciplined relief distribution work, and above all the people made it clear to the rulers of India that their brutalities or economic packages can’t kill or buy our sentiment for azadi. Having said that, there are some concerns as well. For example, this uprising failed to demolish India’s political writ in Jammu Kashmir, which exists in the form of MLAs, MLCs, etc. It failed to build pressure on bureaucrats and police officers to resign, and it became clear yet again that we lack effective international diplomatic front. I must insist that Pakistan’s Kashmir Committee under the chairmanship of Molvi Fazlur Rehman has been a big disappointment. It should be closed. The most positive thing of 2016 uprising was the death of PDP. It took people of Kashmir 50 years (1938-1988) to demolish National Conference’s political and social sanctity. The PDP, which was founded by Indian intelligence agencies as an alternative to the National Conference to keep the people of Kashmir engaged with the Indian political institutions (Assembly and Parliament), lost its political and social sanctity in just 17 years (1999-2016). 2016 was the year of PDP’s death. KN: You are Kashmir’s longest serving prisoner, with 23 years in jail now. Do you think you and your family’s sacrifice is worth, given that there is no dearth of so-called resistance leaders who have covertly or overtly betrayed the struggle? Why don’t you call off your struggle? DQ: We are accountable before Allah not for results we achieve but for the efforts we put in. I am not here to seek reward or acknowledgement from people for my sacrifices. Whatever my family and I have done for the resistance movement is to appease Allah alone. It has been proved time and again that the whole Millat Islamia of Kashmir is with this movement, so there is no question of calling it off. We well prefer to perish from the face of the earth than to succumb to India’s imperialistic designs. Nor are we going to accept India as our nation. We are here to resist Indian occupation by all indigenous means. When India is not ready to quit its illegal occupation of Jammu Kashmir why should we give up our just and legitimate resistance? KN: You’re an ardent advocate of Kashmir’s merger with Pakistan. In your writings, you passionately argue that Pakistan is the second country that was formed in the name of Islam after Madinah. But even after seven decades of independence, Pakistani rulers have failed to implement Shariah in their country. DQ: Today or tomorrow Pakistan will emerge as an Islamic State because secularism in Pakistan will undo the two-nation theory on which the country was created. Pakistan’s importance as an Islamic state can be understood only by knowing the history of Hindu India, culture of India and particularly by understanding Hindutva’s designs about Islam and Muslims in the subcontinent. KN: Are you in favour of holding a plebiscite in Kashmir in line with the UN-backed resolutions? How confident are you that Kashmiris will choose Pakistan over India? DQ: UN resolutions do not form the base of our freedom movement; it is just a supportive mechanism. The historical base of our movement is the two-nation theory. To put it in simple words, Kashmir remains an unfinished agenda of Partition. Indian National Congress was against the merger of Jodhpur, Jaisalmer, Junagadh and Hyderabad with Pakistan, because all these states had a Hindu majority. If that was the case, how could a Muslim majority Jammu Kashmir remain with India? It is against the very principles on which Partition took place. KN: Is independent Kashmir a possible solution? KN: Is there any room in your struggle for many ‘secular’ Kashmiris who are offering sacrifices for azadi too, though for political reasons and not religious as you would have liked? DQ: Whosoever believes that Indian occupation of Jammu Kashmir is illegal and illegitimate and is ready to resist it, we can cooperate with them on issue-based lines. KN: There is too much debate on Article 370. Is it a protection to Kashmiris or a tool for assimilation into the Indian Union? DQ: This debate is a non-issue for those who are resisting Indian occupation. KN: You once said that participating in elections under the Indian constitution is ‘kufr’ (blasphemy). Aren’t you doing takfeer (declaring a Muslim to be out of the fold of Islam) and making it lawful to shed their blood? DQ: Yes, I stand by what I said. Participation in elections under the Indian constitution tantamount to shirk (polytheism). But doing takfeer is an entirely different thing. People in Jammu Kashmir do not know that it is a polytheistic act to participate in assembly and parliamentary elections. Pro-occupation stooges here are befooling them by saying it is just bijli, sadak and paani like issues they want to deal with. So it is jahalat (ignorance) which saves them from takfeer. There are four excuses (uzrat) on the basis of which one can be spared from being declared out of the fold of Islam—jahal, jabar, khata and tawil. So I am not doing takfeer of common people. But those who know sovereignty is with Allah alone and even then assign it to humans by making them lawmakers that too when they are unbelievers and oppressors, I doubt their faith. KN: Many resistance leaders including Syed Ali Geelani have condemned the Daesh as an anti-Islam outfit. You’ve however so far refrained from making any comment on the Daesh. Does you silence means endorsing the group and its activities? DQ: Yes, I have not made any comment on the Daesh. The Holy Qur’an says: ‘Say not or do not or witness not that of which you have no knowledge’ (al-Isra-36). Therefore, how can I make a comment on something about which I know nothing? KN: Do you welcome the return of migrant Kashmiri Pandits to the Valley, whether in separate colonies or to their original places? DQ: When we are not responsible for their migration, how can we invite them to return? It is their right and choice to decide whether they want to return or not. 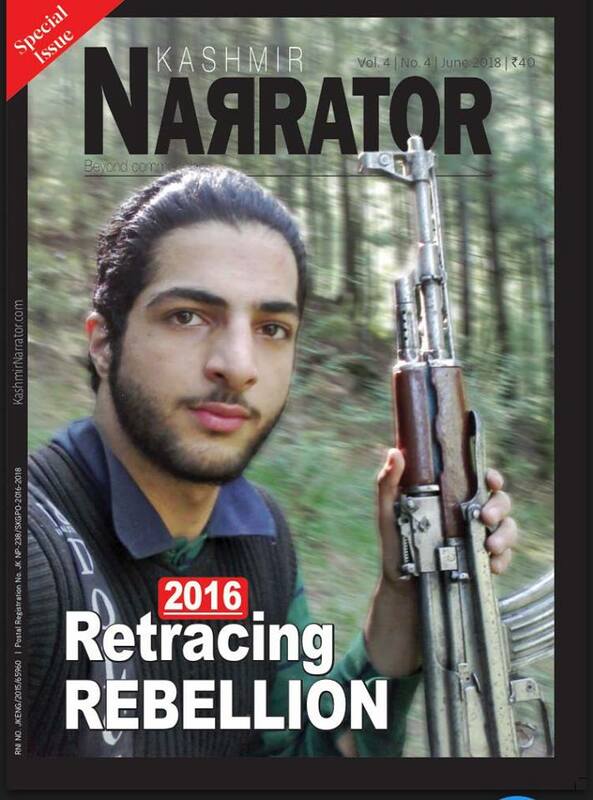 KN: In the wake of 2016 agitation, many youth are joining militant ranks. What will be your advice to them since you’ve in the past said that “militants are neither able to abolish India’s writ, nor are they able to create any problem for the Indian Institutions”? DQ: I have no idea of the present ground situation as I am behind the bars from last 23 years. So it is the leadership of United Jihad Council that has to decide how to make the armed struggle result-oriented. KN: What is your analysis of former RAW chief A.S Dulat’s book titled Kashmir: The Vijpayee years. He has named a number of pro-freedom leaders being close to him and alleged that some have been on the payroll of Indian agencies. How far do you think these revelations are true? DQ: What Dulat has revealed in his book was already revealed by various newspapers on different occasions. So it does not add any new information to my knowledge. It is the moral duty of those who were accused by Dulat of having relations with him to clarify their position. For me, it is against Islamic teachings to have any kind of relationship with the politicians and intelligence and police officers of an enemy country. KN: Did Dulat ever try to meet you? KN: Dulat has in his book blamed you for “radicalising” the youth inside Srinagar’s central jail. How far is that true? DQ: I fail to understand what he means by radicalization. If he means to say I am motivating youth to resist Indian occupation then I do not find any wrong in it. I feel proud of it. But if he means that I am preaching sectarianism, then he’s terribly wrong. I have been preaching against sectarianism, and everybody knows it. DQ: We know that in the past government used to put under house arrest only those leaders whose imprisonment would have endangered their life or would have created law and order problem. But it has now become routine; even activists are claiming that they have been put under house arrest particularly when the situation demands them to play an active role. I shall not ask them to quit resistance movement. Who am I to ask anyone to quit the movement? But I sincerely ask them to give up this drama, as it only damages their credibility. By remaining under house arrest one can’t become Geelani Sahab. KN: Some people describe you as Ibn Taymiyyah of Kashmir. How much are you influenced by his writings? DQ: No, no I am not Ibn Taymiyyah of Kashmir. I am his follower; I try to follow him in letter and spirit. I feel proud to be the first student of Kashmir who did M. Phil and then PhD on Ibn Taymiyyah. I request Kashmiri youth to read, understand and follow him, as he is the only mujadid (in a wider and complete application of the word) Muslim world has produced till date. Yes, he has influenced me a lot. I always keep his biography with me. KN: There is a perennial debate whether Kashmir’s azadi movement is a political or a religious one. Since you advocate that it is a religious struggle, what is the basis of your argument? DQ: This question is irrelevant for those who do not believe in separation of religion and politics. This question is based on a secular concept of life and only secularists can debate on this. For me, this resistance movement is as sacred as worshipping Allah, just as offering Salah and keeping Ramadan fast. Whole Qur’an is proof of it. KN: You have spent half of your life in jail. Do you want your children to follow your footsteps, and how far are they willing to be a part of the movement? DQ: My wife and I want our two sons to serve the movement after completion of their studies. As you know my elder son, Muhammad Bin Qasim, was 6-months-old when we were arrested in 1993. In 1999, when I was rearrested after a year and half of freedom, the other son, Ahmad Bin Qasim, was just two-months-old. Asiyah too has spent more than eight years in different prisons and she is very busy with her religious, academic, social and political engagements. Both our sons have been deprived of parental love and care. KN: You advocate that Syed Ali Geelani should be taken as a leader of the movement. Since he is very old and not keeping well, who do you want to be the leader in his absence or, for that matter, after his death? DQ: Muhammad Ashraf Sehrai Sahab should succeed Geelani Sahab. To put this question in a wider application I would like to say that, whosoever is resisting Indian occupation with Islam as his inspiration is Geelani’s successor. KN: You recently asserted that joining government services here is unlawful ‘according to Shariah’. It sparked a heated debate in local newspapers. Do you still hold your views, given that tens of thousands of Kashmiris are working in the government as they don’t have a viable alternative? DQ: If Indian occupation is illegitimate, elections which are taking place here are also illegal and illegitimate. A government which emerges out of this occupation is illegal and illegitimate too. The child born of illegitimate relationship is an illegitimate child. It is not only my belief that to serve an occupational government is haram. In 1922 more than 500 Indian scholars in their fatwa declared it haram to become a member of the British legislative councils and to serve British government, particularly in the army and police. There are scores of Quranic verses which strictly prohibits Muslims from serving unbelievers and oppressors, particularly when they are at war with Muslims. The question is if you believe that Indian occupation is illegitimate, so is her government. If you consider India oppressor, how can you serve it? Only 5 percent of our population is working in the government. What about 95 percent? How are they earning their livelihood? KN: You launched your organisation Muslim Deeni Mahaz some years ago. Why did you start it as there are already a plethora of outfits? You yourself denounce raising more than one mosque in a locality. What then prompted you to start your own organisation? DQ: There are only two cadre-based religious organisations in Kashmir, rest are religious and political groups. The problem with these two organisations is that one of them believes in the separation of religion and politics; its track record will tell you it is absolutely apolitical organisation and it has never challenged Indian occupation, nor it has ever participated in resistance movement; it is sectarian in its outlook and practice. The other organisation does not believe in separation of religion and politics. But what is shocking is that while its literature condemns secularism and nationalism, it is participating in secular and national elections; it considers Kashmir disputed territory but contests elections within the constitution of India. I believe this ‘organisationalism’ has proved harmful for both dawah work and resistance movement. I believe in Amir and Mamur concept of Islam based on bayat (oath of alliance and obedience) for serving religion and society. I am looking for youth who too believe in Amir and Mamur concept of Islam. The moment I find required number of them I will not hesitate to wind up my outfit.